The astronomical winter solstice will not occur for a week or so, but the shortest day on the Christian calendar is that associated with the Feast of Saint Lucia or Lucy, occurring on December 13. 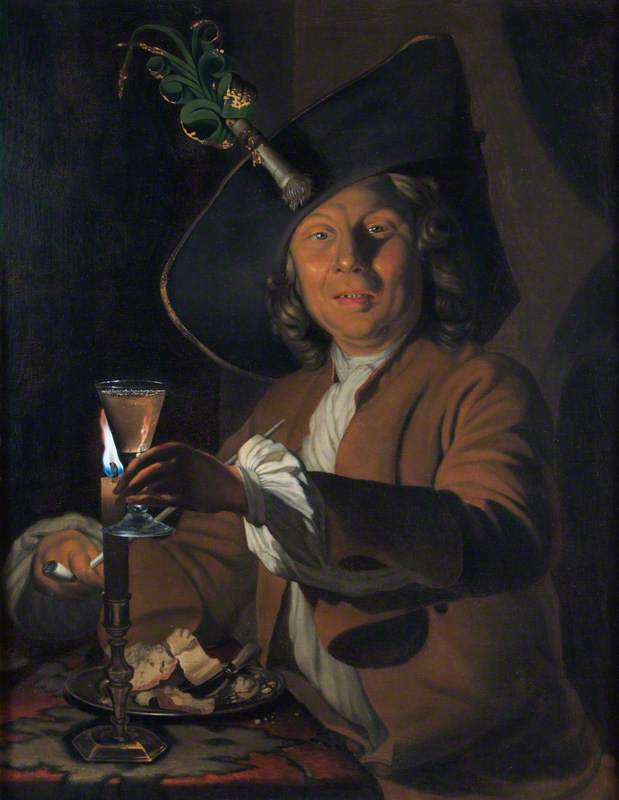 John Donne referenced this connection in his poem A Nocturnal upon Saint Lucy’s Day: ‘Tis the year’s midnight, and it is the day’s,/ Lucy’s, who scarce seven hours herself unmasks;/ The sun is spent, and now his flasks/ Send forth light squibs, no constant rays;/ The world’s whole sap is sunk;/ The general balm th’hydroptic earth hath drunk,/Whither, as to the bed’s feet, life is shrunk,/ Dead and interr’d; yet all these seem to laugh,/ Compar’d with me, who am their epitaph. Lucia’s story is part late antique and part late medieval: the earliest accounts depict her as a young virgin martyr from Sicily who was put to death in the Diocletian persecution at the beginning of the fourth century. She had devoted herself to Christ following the miraculous recovery of her mother from chronic “bloody flux” (dysentery) and afterwards devoted herself to distributing her not-inconsiderable dowry to the poor of the island. Her spurned betrothed turned her over to the Roman authorities, and she was tortured and threatened with “fouling” in a brothel. Her virtue and virginity were maintained by another miraculous intervention which rendered her body immovable, but she was martyred by a sword to her throat (after burning also failed). Her veneration seems almost immediate, and by the sixth century Lucy’s story had spread through much of Europe. Her association with “light” (lux in Latin) seems to come principally from her name, but in the later medieval era she also became a patron saint to the blind and those with eye diseases: we increasingly see her with attributes of eyes (generally on a plate) from the fourteenth century on, and this depiction becomes standard with the Renaissance. British Library MS Additional 22310 (Venice, 1460-70); Francesco del Cossa, Saint Lucy, 1473-74, National Gallery of Art (and detail); Francisco de Zurbarán, Saint Lucy, 1625-30, National Gallery of Art, Washington. Once Lucy became associated with both light and sight, the eyes appear in her depictions and then a story is constructed and grafted onto her hagiography–but it has variations: sometimes Lucy is punished for her vision of the end of Roman rule by the gouging out of her eyes before her martyrdom; in other accounts she gouges them out herself to repel her pagan fiance. Each tales develops its own embellishments: Lucy’s eye’s were so beautiful that both the emperor Maxentius (whose reign would soon end according to her “vision”) and her evil and equally pagan betrothed wanted them gone; Lucy’s faith was so strong that she sacrificed her most beautiful feature so that she could “see” in only that way. The Martyrdom of Saint Lucy, Watercolor, n.d., Wellcome Library and Images, London. The equation of “light” with “sight” in these ways, over time, is just one interesting aspect of Lucy’s veneration. Another is its durability–and its range: even after the Reformation she maintained her stature in Protestant Europe and even increased it in largely Lutheran Scandinavia. Lucy/Lucia is venerated in parts of Italy and eastern Europe too, but it’s the Scandinavian rituals that really interest me, because I can’t quite figure out whether they are a continuation or “invention” of tradition. As the first references to Lucia rituals are in the eighteenth century and the first national processions in the twentieth, I’m guessing the latter, but clearly they had a cultural basis that was rooted in both the Christian and pre-Christian past. On December 13, white-clad, red-sashed “Lucias” lead singing processions out onto the streets wearing head wreaths made of lit (by wax or battery) candles; in the home, the household Lucia serves her family a substantial breakfast of special saffron buns (lussekatter–with raisin “eyes”!) after the long winter’s night. These Lucias bring light into their world on the darkest day of the year, when there is none. Photogravure of St. Lucia’s Day, 1898, Wellcome Library; The crowned Lucia at this year’s Festival of St. Lucia at York Minster, sponsored by the York Anglo-Scandinavian Society (© Ian Forsyth/Getty Images); Carl Larsson’s Christmas Morning, published in “Lasst Licht Hinin”; St. Lucia’s Day Saffron Buns at Simply Recipes. There is a holiday more feminine than Thanksgiving and it is today: the feast day of St. Catherine of Alexandria, whose hagiography established her as the patron saint of philosophers and students in the Middle Ages, and of unmarried women and milliners in the modern era. An interesting evolution from the spiritual to the secular, like many medieval saints, with librarians and all penitents in need representing the transitional beneficiaries. According to her Legend, Catherine was a lovely young woman of noble birth in the early fourth century who converted to Christianity following a vision. She caught the eye of the Emperor Maxentius (r. 306-312) and her refusal to marry him resulted in her martyrdom: after she shattered the first instrument of her torture and execution, a spiked wheel, with a mere touch, she was put to the sword and beheaded. Catherine is seldom seen without these attributes as reminders of the strength of her faith, but there is also a genre of Renaissance depictions which show her rising above them and vanquishing the evil emperor. Friedrich Pacher, Saint Catherine of Alexandria, 15th-16th century, deYoung/Legion of Honor Museums, San Francisco; Master of the Legend of Saint Lucy, Saint Catherine of Alexandria, with the Defeated Emperor (c. 1482), Philadelphia Museum of Art. I’m not sure of the precise transition, but at some point in the later eighteenth or nineteenth centuries, Catherine evolved in a patron saint for spinsters, or more precisely unmarried women over the age of 25. This was particularly a French development, and young women began to commemorate the day by praying to Saint Catherine for a husband, donning hats specially made for the occasion, and sending notes and cards to each other as a form of comfort and companionship. The emphasis on hats led to another evolution of Catherine’s patronage, and she became associated more specifically with unmarried women who worked in the fashion and millinery trades of Paris, where large “Catherinette” celebrations occurred on this day in the 1920s and 1930s, a “tradition” that was revived after World War II and apparently continues to this day. As would only be fitting for the women who worked in these creative industries, the hats worn by the Catherinettes were often (but not always) confined to Catherine’s colors of yellow (for faith) and green (for wisdom), but also exemplified unlimited forms of structure, substance and style. And still do. Catherinettes in the 1930s (from Ernest Flammarion’s Paris (1931)) and 1950s; a modern print of vintage Catherinettes; a St. Catherine’s Day card from the 1940s, and a Chanel Catherinette creation, 2013. Today, a national holiday of Wales based on its association with the Welsh patron Saint David (c. 500-c. 589), affords yet another opportunity to explore one of my favorite themes: the secularization of saints’ days. This is a touchstone in several of my courses and a subject I’ve returned to here again and again: on Halloween, St. Nicholas’s Day, Valentine’s Day, St. Patrick’s Day, and even the feast day of the lesser-known St. Swithun. There’s no question in my mind that one of the most basic tasks, and most popular consequences, of the Reformation was the transformation of the Christian calendar. This transformation was dramatic: Saint David appears to have been one of the most ascetic of saints (a bold claim, perhaps too bold), forswearing beer and meat in favor of water and bread seasoned with a few grains of salt and herbs, yet today his day is celebrated with parades and cupcakes embellished with Welsh dragons and daffodils, and the leeks which became more particularly associated with him over time. 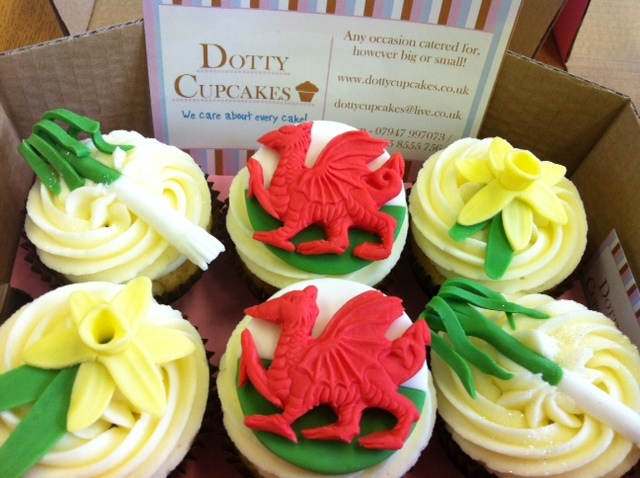 British School, A Celebration of Saint David’s Day, c. 1750, National Museum Wales, Cardiff; Dotty Cupcakes, Cardiff, featured here. 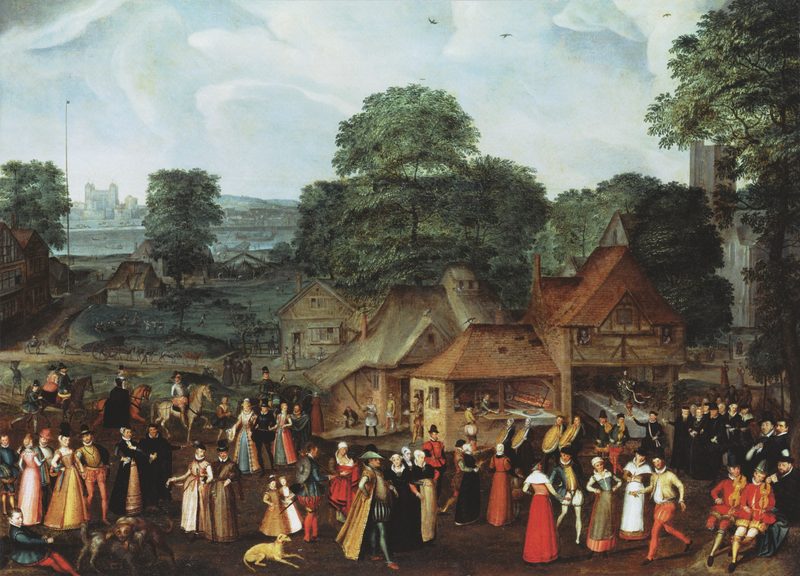 The most revealing illustration of this process occurred during the Elizabethan era, when the Queen–or her advisers and followers and assorted hangers-on–rather deliberately emphasized the coincidence of dates shared by Elizabeth and the Virgin Mary: September 7 (Elizabeth’s birthday and the Eve of the Feast of the Nativity of the Virgin Mary) and March 24 (the day on which Elizabeth died in 1603, and the Eve of the Annunciation of the Virgin Mary). Moreover, the “Queene’s Day”, November 17, the day of which Elizabeth acceded to the throne in 1558, achieved the status of both a national holiday and a religious holiday over her reign. And thus the Virgin Queen and “the cult of Elizabeth” (a phrase first used by Sir Roy Strong) emerged. There’s no agreement that the feast displayed below represents an early celebration of the Queene’s Day, but I like to think that Joris Hoefnagel’s iconic painting Fete at Bermondsey (c. 1569-70)–one of my very favorites– does just that.